Kylie Had A Baby, But What’s Her Name?? Unless you’ve been living under a rock for the last 24 hours, you’ll know that the internet had a small meltdown when Kylie Jenner finally confirmed that not only was she pregnant...but she had her baby! February 1st, Kylie gave birth to her first child with Travis Scott, and we learned that she had a baby girl. Now, we already knew Kylie was pregnant, but what I (and most of Twitter) is wondering now is...what’s baby girls name? 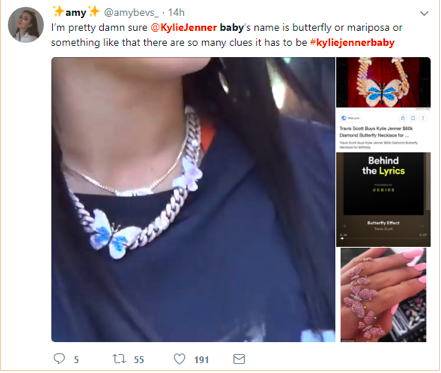 There have been some speculations that the newborn's name could be Butterfly, from all the butterfly images we’ve seen throughout the past few months, but Twitter has some other ideas, check them out below and be sure to let us know your ideas on what Kylie may have named her baby! So what do you think the baby’s name is? Drake Donates $25k To High School In Miami!